Get high-performance printing for your busy workgroup with the WorkForce Pro WF-4730 all-in-one printer. Powered by revolutionary PrecisionCore technology, the WF-4730 delivers Performance Beyond Laser and print-shop-quality prints with laser-sharp text. Featuring the fastest color print speed in its class (1) and a 500-sheet paper capacity, it’s perfect for high-volume printing — with two trays, you’ll replace paper less often. And, it’s easy on the budget, offering up to 50 percent lower printing costs vs. color laser (2). Plus, its 35-page Auto Document Feeder and auto 2-sided printing enhance your productivity. Combining powerful performance with a space-saving design, it offers extraordinary efficiency. 1. Compared to best-selling business inkjet printer models priced under $200 and color multifunction laser printer models priced under $300 (USD). Competitive data gathered from manufacturer websites and third-party industry sources as of July 2016. 2. Up to 50 percent compared with best-selling, color laser multifunction printers priced at $299 (USD) or less, as of August 2016. Calculation based on continuous printing with highest-capacity individual cartridges sold in retail. Actual savings will vary based on print task and use conditions. 3. Most features require an Internet connection to the printer, as well as an Internet- and/or email-enabled device. 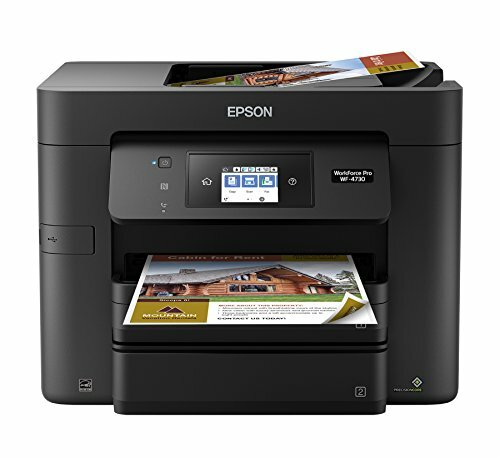 For a list of Epson Connect enabled printers and compatible devices and apps, visit out official site.